We love our Ben’s Chili Bowl. And we REALLY love that we can enjoy it at Nats Park. 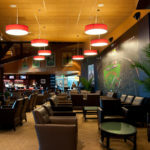 But when you have a few more bucks to spend – and by “a few” we mean “a couple hundred” – you can splurge on some incredible seats and delectable food options. There are two premium dining and seating options that the public can purchase – the Lexus Presidents Club and PNC Diamond Club. The Presidents Club is, well, the “Lexus” of the seating and dining experiences. This is where the best seats in the house are reserved for members of the military and their families. It’s also where the price of a ticket – about $325 – can buy a seat with home-plate views and premium, all-you-can-eat meals. Heck, you can even choose to eat inside, outside or have your meal brought to your seat! Chef Terry introduced us to one of his sous chefs, Jacob Daniels, who creates meals for an average of 300 people daily. Capacity is 450 indoors and there are another 400 seats outside. A slow day is service for 225. Daniels said that salads are incredibly popular, as one would expect, during the hot summer months. He creates nine salads daily – always varying the ingredients – as there are several vegans who dine with him. Part of his daily routine is to accommodate fans with dietary restrictions making special requests. Chef Daniels’ focus on service and quality was evident as he discussed his willingness to be available to the customers for comments and questions. The Lexus President’s Club truly is a premium experience. 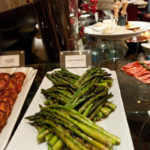 The centerpiece of Daniels’ daily offerings is the Farm to Fork table. 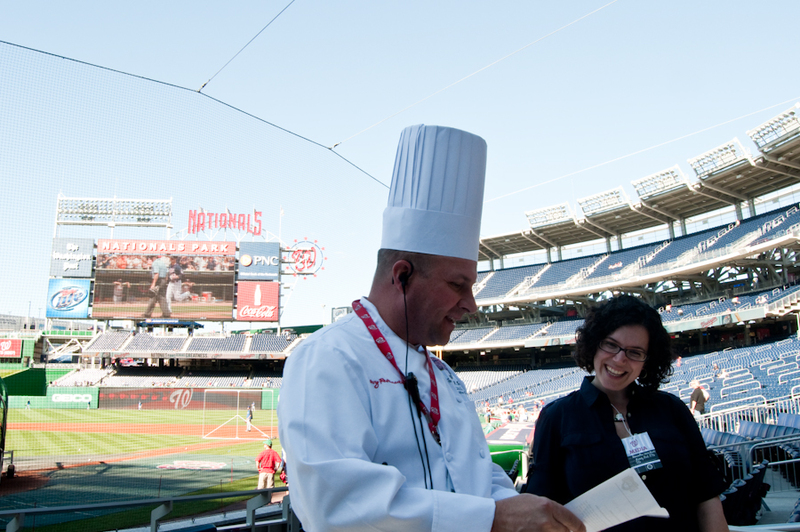 The menus are often created while the Nats are out of town and vary based upon the availability of local ingredients. This is a prime example of chef creativity coupled with Levy innovation. Finding beautifully designed tables with healthy, local ingredients surpassed our expectations for a ballpark. 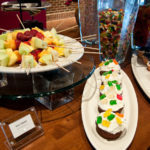 Other tables in the Presidents Club offer desserts, such as chocolate cake and fresh fruit, an antipasto table offering grilled asparagus, roasted tomatoes and an ever-changing selection of cheeses, and carved items like honey mustard smoked corned beef. We were also eyeing the green apple coleslaw. From the Presidents Club, we walked outside and up the stands to the more casual PNC Diamond Club. 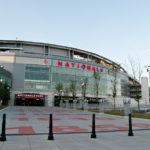 On Saturdays, the club hosts an interview with a Nationals team member, an interactive event that allows members to ask questions of the players. As we mentioned, there are a series of chef tables in each club. 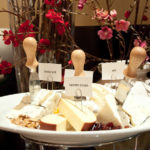 Some rotate, and the day we visited the Diamond Club, the chef set up a chopped salad station with beautiful ingredients and three house made vinaigrettes. There was also a selection of Niman Ranch sausages that looked mouthwatering. Sous Chef Michele Ealey is in charge of Diamond Club concessions, and she made us crave not just her food, but her company, too. Full of personality, Ealey explained that she provides “home cooking. I want my guests to feel like they’re at home.” She serves 700 to 800 people per game on average, 500 on a slow day, and perhaps 1,000 when the club is at capacity. Now in her sixth season with Levy Restaurants, Ealey walks around to get a sense of what the guests enjoy and ask them what they would like to eat in the future. 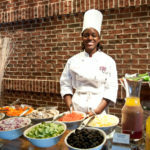 Ealey grew up on southern food, but she makes a variety of foods for every palate and to accommodate people with allergies, vegetarians and vegans. “I really get to show off on Italian day,” she added. While we don’t recommend unbuckling your pants in the restaurant (or any public establishment for that matter), we can see how it’s possible to leave pleasantly full – if not more so – and very happy. 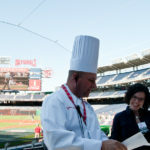 That’s clearly a theme for the Nationals ballpark dining experience. And if you don’t find what it is you’re craving come game day, you can always contact Chef Terry. ""southwest steak with chipotle ranch""
""turkey cobb salad with honey dijon""